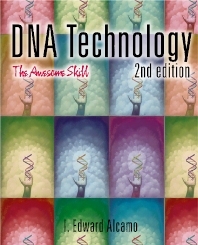 DNA Technology, Second Edition, is a survey of biotechnology written to enlighten readers about the breakthroughs made possible by the science and technologies associated with current DNA research. Ed Alcamo gives the educated layperson a survey of DNA by presenting a brief history of genetics, a clear outline of techniques that are in use, and indications of breakthroughs in cloning and other DNA advances. Appropriate for a wide range of courses for non-biology majors, including a ÒDNA for Lawyers course or allied health and nursing courses. After reading this book, individuals will feel more confident in their ability to understand contemporary newspaper and magazines articles referring to DNA technology and human genetics. Business people will make more confident decisions in their dealings with biotechnology issues. Lawyers and jurists will have a better appreciation of DNA fingerprinting. Persons with genetic disease will have a clearer understanding of their afflictions and understand the bases for possible cures. Agriculturists will have insight to the genetic basis for gene-altered plants and animals. And the general public will better appreciate the nature and reasons for the Human Genome Project now in progress. Molecular biology, DNA technology, DNA science, and other introductory courses for students looking for careers in biotechnology, microbiology, nursing, and other applied life sciences; also teachers and interested laypersons. The author recently retired as Distinguished Teaching Professor of Biology at the State University of New York-Farmingdale. He taught at the college level for 33 years, and has been recognized for Excellence in Teaching by the National Association of Biology Teachers and the State University of New York. He is a Fellow of the American Academy of Microbiology and the author of several textbooks, including Fundamentals of Microbiology (now in its 6th edition), AIDS: The BiologicalBasis, Anatomy and Physiology The Easy Way, and the Microbiology, Biology, and Anatomy and Physiology Coloring Books. State University of New York, Farmingdale, U.S.A.